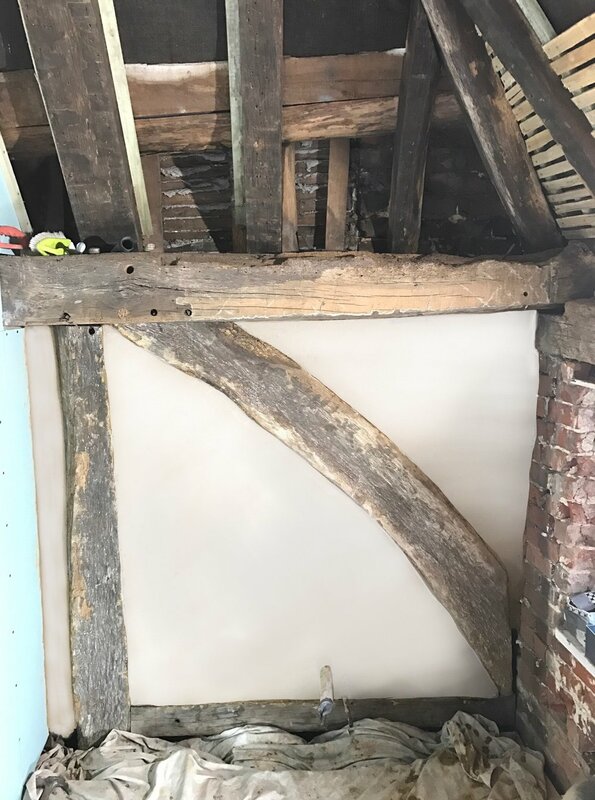 Case study showing our work on a a wattle and daub panel replacement in Guildford, Surrey. Within this 15c Medieval Hall house original timbers had been covered with modern plaster finishes. We removed this modern material then identitied the types of materials originally used and re-placed them like for like. Image 1 shows the panels with the modern materials removed. Image 2 shows us starting to replace the staves with cleft Chestnut. Image 3 shows the start of fitting the Oak riven laths. Image 4 shows the completed panels with laths in place. Image 5 shows the first panel to receive daub. Image 6 shows the completed panels. Image 7 shows the panels lime washed.